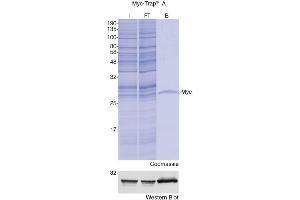 Purpose The ChromoTek Myc-Trap® comprises an antibody fragment coupled to agarose beads for immunoprecipitation of Myc-tagged proteins. Specificity The Myc-Trap® recognizes the Myc-tag sequence EQKLISEEDL at the N-terminus, C-terminus, or internal site of the fusion protein. Characteristics Epitope tags are useful for the labelling and detection of proteins using immunoblotting, immunoprecipitation, and immunostaining techniques. Because of their small size, they are unlikely to affect the tagged protein's biochemical properties. The Myc epitope tag is widely used to detect expression of recombinant proteins in bacteria, yeast, insect and mammalian cell systems. For biochemical analysis including mass spectrometry and enzyme activity measurements these Myc-tagged proteins and their interacting factors can be isolated fast and efficiently by immunoprecipitation using the Myc-Trap®. Myc-Trap® utilizes small recombinant antibody fragments covalently coupled to the surface of agarose beads. 4. Vortex Myc-Trap®_A beads and pipette 25 μL bead slurry into 500 μL ice-cold dilution buffer. Centrifuge at 2.500x g for 2 min at +4 °C. Discard supernatant and repeat wash twice. 1. Resuspend cell pellet in 200 μL ice-cold lysis buffer by pipetting or using a syringe. note: Supplement lysis buffer with protease inhibitors and 1 mM PMSF (not included). optional for nuclear/chromatin proteins: Use RIPA buffer supplemented with 1 mg/mL DNase, 2.5 mM MgCl2, protease inhibitors and 1 mM PMSF (not included). 2. Place the tube on ice for 30 min with extensively pipetting every 10 min. 3. Centrifuge cell lysate at 20.000x g for 10 min at +4 °C. Transfer supernatant to a pre-cooled tube. Add 300 μL dilution buffer to supernatant. Discard pellet. note: At this point cell lysate may be put at -80 °C for long-term storage. optional: Add 1 mM PMSF and protease inhibitors (not included) to dilution buffer. 5. Add diluted supernatant (step 3) to equilibrated Myc-Trap®_A beads (step 4). If required, save 50 μL of diluted lysate for immunoblot analysis. Tumble end-overend for 1 hour at 4 °C. 6. Centrifuge at 2.500x g for 2 min at +4 °C. 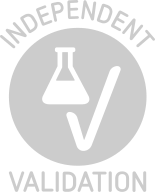 If required, save 50 μL supernatant for immunoblot analysis. Discard remaining supernatant. 7. Resuspend Myc-Trap®_A beads in 500 μL ice-cold dilution buffer. Centrifuge at 2.500x g for 2 min at +4 °C. Discard supernatant and repeat wash twice. optional: Increase salt concentration in the second washing step up to 500 mM. 8. Resuspend Myc-Trap®_A beads in 100 μL 2x SDS-sample buffer. 9. Boil resuspended Myc-Trap®_A beads for 10 min at 95 °C to dissociate immunocomplexes from Myc-Trap®_A beads. Myc-Trap®_A beads can be collected by centrifugation at 2.500x g for 2 min at 4 °C and SDS-PAGE is performed with the supernatant. 10. Optional instead of steps 8 and 9: Reconstitute Myc peptide (code yp-1) in water to a final concentration of 2 mg/ ml. Add ~25 μg Myc peptide in 50-100 μL in dilution buffer to Myc-Trap®_A beads. Mix for 15 min at RT. Centrifuge at 2500xg for 2 min and carefully transfer supernatant to a new tube. To increase elution efficiency this step can be repeated. Product cited in: LaFlamme, Young, Lang, Weiser: "Alternative splicing of (ppp1r12a/mypt1) in zebrafish produces a novel myosin phosphatase targeting subunit." in: Gene, Vol. 675, pp. 15-26, 2018 (PubMed). Biddau, Bouchut, Major, Saveria, Tottey, Oka, van-Lith, Jennings, Ovciarikova, DeRocher, Striepen, Waller, Parsons, Sheiner: "Two essential Thioredoxins mediate apicoplast biogenesis, protein import, and gene expression in Toxoplasma gondii." in: PLoS pathogens, Vol. 14, Issue 2, pp. e1006836, 2018 (PubMed). Suzuki, Gacquer, Van Heurck, Kumar, Wojno, Bilheu, Herpoel, Lambert, Cheron, Polleux, Detours, Vanderhaeghen: "Human-Specific NOTCH2NL Genes Expand Cortical Neurogenesis through Delta/Notch Regulation." in: Cell, Vol. 173, Issue 6, pp. 1370-1384.e16, 2018 (PubMed). Liu, Moss: "Vaccinia Virus C9 Ankyrin Repeat/F-Box Protein Is a Newly Identified Antagonist of the Type I Interferon-Induced Antiviral State." in: Journal of virology, Vol. 92, Issue 9, 2018 (PubMed). Berry, Chen, Francia, Guerin, Graindorge, Saliou, Grandmougin, Wein, Bechara, Morlon-Guyot, Bordat, Gubbels, Lebrun, Dubremetz, Daher: "Toxoplasma gondii chromosomal passenger complex is essential for the organization of a functional mitotic spindle: a prerequisite for productive endodyogeny." in: Cellular and molecular life sciences : CMLS, Vol. 75, Issue 23, pp. 4417-4443, 2018 (PubMed). Robeson, Lindblom, Wojton, Kornbluth, Matsuura: "Dimer-specific immunoprecipitation of active caspase-2 identifies TRAF proteins as novel activators." in: The EMBO journal, Vol. 37, Issue 14, 2018 (PubMed). Ma, Gil, Grasser, Mas: "Targeted Recruitment of the Basal Transcriptional Machinery by LNK Clock Components Controls the Circadian Rhythms of Nascent RNAs in Arabidopsis." in: The Plant cell, Vol. 30, Issue 4, pp. 907-924, 2018 (PubMed). Palma, Pugliese, Murfuni, Marabitti, Malacaria, Rinalducci, Minoprio, Sanchez, Mazzei, Zolla, Franchitto, Pichierri: "Phosphorylation by CK2 regulates MUS81/EME1 in mitosis and after replication stress." in: Nucleic acids research, Vol. 46, Issue 10, pp. 5109-5124, 2018 (PubMed). Ho, Lin: "RNF144A sustains EGFR signaling to promote EGF-dependent cell proliferation." in: The Journal of biological chemistry, Vol. 293, Issue 42, pp. 16307-16323, 2018 (PubMed). Vukoja, Rey, Petzoldt, Ott, Vollweiter, Quentin, Puchkov, Reynolds, Lehmann, Hohensee, Rosa, Lipowsky, Sigrist, Haucke: "Presynaptic Biogenesis Requires Axonal Transport of Lysosome-Related Vesicles." in: Neuron, Vol. 99, Issue 6, pp. 1216-1232.e7, 2018 (PubMed). Costello, Castro, Schrader, Islinger, Schrader: "Peroxisomal ACBD4 interacts with VAPB and promotes ER-peroxisome associations." in: Cell cycle (Georgetown, Tex. ), Vol. 16, Issue 11, pp. 1039-1045, 2018 (PubMed). Zhang, Yin, Liu, Tong, Xing, Zhang, Pudake, Izquierdo, Peng, Xin, Hu, Ni, Sun, Yao: "The E3 Ligase TaSAP5 Alters Drought Stress Responses by Promoting the Degradation of DRIP Proteins." in: Plant physiology, Vol. 175, Issue 4, pp. 1878-1892, 2018 (PubMed). Hunter, Hesketh, Benedyk, Gingras, Graham: "Proteomic and Biochemical Comparison of the Cellular Interaction Partners of Human VPS33A and VPS33B." in: Journal of molecular biology, Vol. 430, Issue 14, pp. 2153-2163, 2018 (PubMed). Liao, Beveridge, Hudson, Parker, Chiang, Ray, Ashour, Sudbery, Dickman, El-Khamisy: "UCHL3 Regulates Topoisomerase-Induced Chromosomal Break Repair by Controlling TDP1 Proteostasis." in: Cell reports, Vol. 23, Issue 11, pp. 3352-3365, 2018 (PubMed). Meyer Zum Büschenfelde, Brandenstein, von Elsner, Flato, Holling, Zenker, Rosenberger, Kutsche: "RIT1 controls actin dynamics via complex formation with RAC1/CDC42 and PAK1." in: PLoS genetics, Vol. 14, Issue 5, pp. e1007370, 2018 (PubMed). Taulet, Vitre, Anguille, Douanier, Rocancourt, Taschner, Lorentzen, Echard, Delaval: "IFT proteins spatially control the geometry of cleavage furrow ingression and lumen positioning." in: Nature communications, Vol. 8, Issue 1, pp. 1928, 2018 (PubMed). Pimmett, Deng, Haskins, Mercier, LaPointe, Simmonds: "The activity of the Drosophila Vestigial protein is modified by Scalloped-dependent phosphorylation." in: Developmental biology, Vol. 425, Issue 1, pp. 58-69, 2017 (PubMed). Huang, Li, Biener, Xiong, Malik, Eaton, Zhao, Raicu, Kong, Zhao: "Carbonic Anhydrases Function in Anther Cell Differentiation Downstream of the Receptor-Like Kinase EMS1." in: The Plant cell, Vol. 29, Issue 6, pp. 1335-1356, 2017 (PubMed). Li, Wang, Huang, Ahsan, Biener, Paprocki, Thelen, Raicu, Zhao: "Two SERK Receptor-Like Kinases Interact with EMS1 to Control Anther Cell Fate Determination." in: Plant physiology, Vol. 173, Issue 1, pp. 326-337, 2017 (PubMed). Lutter, Ullrich, Lueck, Kempa, Jentsch: "Selective transport of neurotransmitters and modulators by distinct volume-regulated LRRC8 anion channels." in: Journal of cell science, Vol. 130, Issue 6, pp. 1122-1133, 2017 (PubMed).